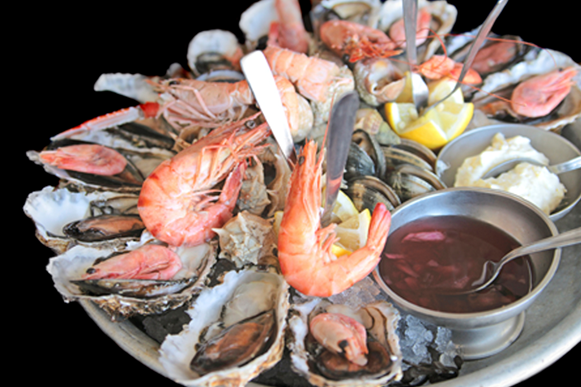 Shellfish poisoning, have you ever suffered from it? There is rule that when there is not a “R” in the month you should be more careful on eating clams, oysters, mussels or scallops. Today with more commercial harvesting that risk or rule has been greatly reduced. I gather in the months of May, June, July and August- the northern hemospheres (usually) warmer months- there is higher potential where algal blooms and also in European climate, some shellfish are less palatable as oysters, for example, are spawning at this time. This raises the risk that can spread toxins and lead to a possible poisoning. Now you might be wondering what this has got to do with innovation? Well, I’m off to Singapore for ten days in early May and I certainly will be ‘hitting’ the shell-fish buffet but really innovation is top of my agenda for this visit and one thing that I will remind people about is to focus on the “R” in innovation. What do I mean by focusing on the “R” in innovation? My three “R’s” are Revitalise, Renovate and Regenerate, all often ignored within innovation. How often do we push on regardless, ignoring a number of warning signs and don’t take the time to stop and take stock to see what we can shed and simply get rid of. I wrote a piece early last year (http://bit.ly/eOuO82) about “Writing off legacy within your innovation systems” as we tend to layer on to existing systems and processes instead of taking the chance to step back and see things from the current or future perspective, we stay locked in our past learning and approaches. Well I certainly feel we all need to re-think that for shedding legacy. We also need to find those three “R’s” hidden within innovation. Firstly you need to challenge your vision and where innovation is required to fit. Often by simply resetting the vision and how innovation fits within your (evolving) strategy does make a difference to everyone’s understanding of the purpose and direct from their innovation efforts. We do need to constantly change, to challenge and to revitalise on a regular basis. We need to redefine what we are wanting out of innovation and then take that fresh look at systems, processes, cultures and capabilities. We need to produce a revitalisation ‘action plan’ that restores and refreshes the ‘impact’ points that innovation can offer. Restoring the value of innovation needs to be constantly rethought at corporate and operational level. Organizations are constantly searching for continuous improvement; it often comes in many different guises. Innovation should equally have a clear renovation programme, no different from all the other organization activities that need improving. Putting in place a consistent industry or even cross-industry benchmarking programme, or focusing on more material enhancement, knowledge learning and seeking out changes makes significant difference in your performance, should all be part of this. We often get ‘stuck’ in our own ways of doing things and often it is only when a crisis ‘hits’ we suddenly seek difference positions but that can often be too little, too late. I think there is a need to be constant on improving innovation, we need to renovate innovation continually or we risk the case of often missing out or letting our competitors slip away and move ahead in the lead. The other part of renovation is to review the ‘content and context’ of innovation. We need to update, modify, change, drop and merge these and that is an essential part of the renovation programme, to evaluate the content and the context constantly. There are always design considerations within innovation. We need to constantly seek simplicity, motivation, involvement and improving the existing culture. We need to regenerate ourselves. Our people need to constantly upgrade their competencies and skills, they need to engage within teams, seek out diversity of opinion to stretch their own thinking and they need to form or generate new connections and deepen external relationships to learn more of what is going on in the world. Those that stop learning are the losers and those around them feel the frustration of this. To regenerate constantly makes for a learning organization. We need to undergo spiritual, moral and physical renewal for improving our culture and climate to innovation so much more than we do, we often leave this to chance and not thoughtful design. 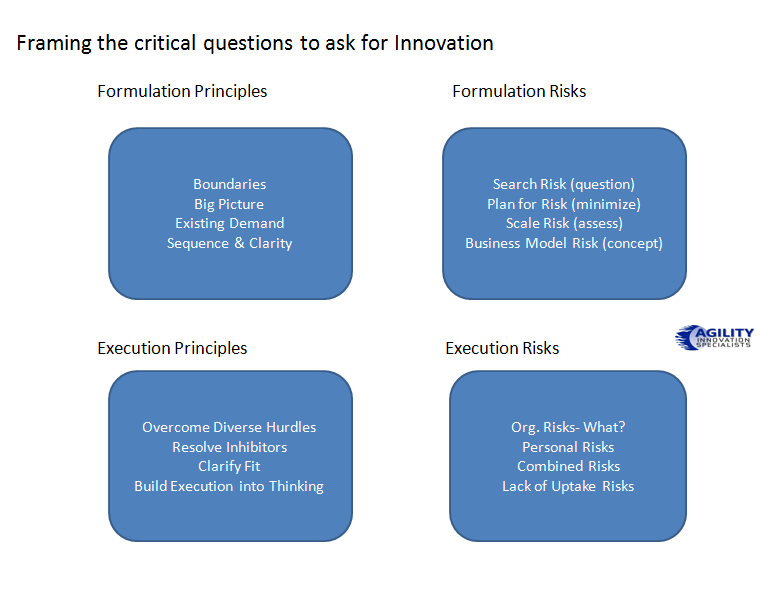 Each of the above “R’s” is vital to build into your innovation plans. So you need to make sure there is always an “R” in your innovation, not only will it be ensuring innovation remains fresher but it will also help rid you of those harmful toxins that can poison your best efforts if you did chose to ignore the “R” in innovation. I loved one comment about eating shellfish “whether it is January or June, you can eat these plump beauties with impunity”. So let’s hope the combination of (hopefully) fresh seafood in Singapore and my worries that so many organizations may have forgotten to heed the “R” in innovation, does get heard by everybody who cares to listen, and I don’t suffer any punishment or unpleasant set of consequences from this. Believe me your innovation efforts do benefit by recognizing that these three “R’s” do need to be constantly at the forefront of your innovation eating thinking. By the way, innovation with impunity sounds very intriguing. Time passes extremely quickly, particularly when you enjoy yourself, or so it seems for me. I was surprised, going through some of my past blogs, the time between related entries on the need for having in place a sustaining competitive advantage framework on innovation, has been longer than they it should have been. This blog is the third entry on this subject. Always, always and always do I see organizations struggle to align themselves for their innovation activity, why is this? Either alignment of innovation into the strategy they are (assumedly) following or shaping innovation into the context of where and how innovation can fit. Required past reading possibly needed here. Both offer a helpful introduction to the framework and formula. 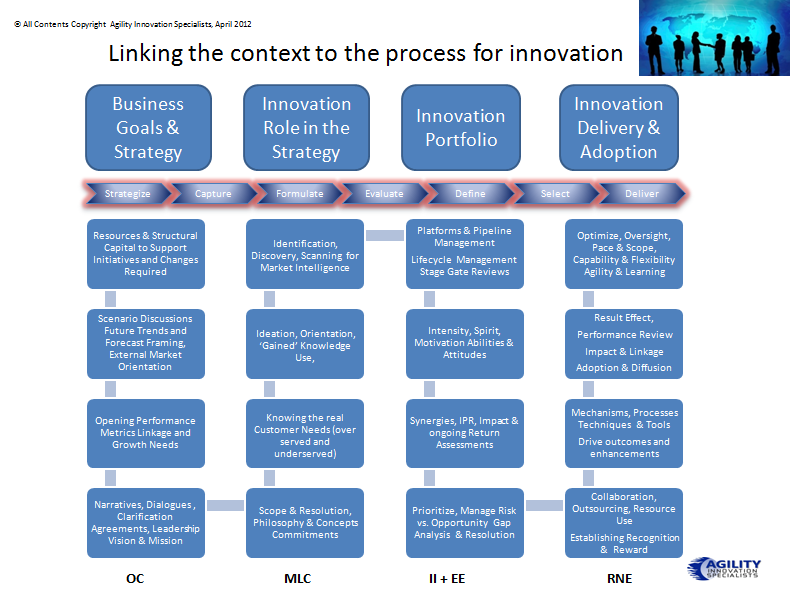 This blog ‘advances’ this framework by attempting to link the context of innovation into a process to think through. I say attempting because we need to accept each building process is different, and unique to the organization and the circumstances of what they want innovation to achieve, besides the standard reply “growth and profit”. Doesn’t this always sounds like the famous question asked at beauty pageants: “So what’s the most important issue for you?” asks the compare with the reply “world peace”. Oh, I wish it was so simple. Those leaders that talk of “growth and profit” from innovation seem to reduce it to just a sound bite, I just wish it was so simple. I do wish the majority of our business leaders would get ‘into’ innovation understanding a lot more. Innovation breaks down always outside the CEO’s executive door and it really does need them to step outside and get more fully involved as it is a major area to succeed at if a longer tenure is in their minds. Still, I digress. Here I outline how I see a typical linking through of a context to innovation in a ‘flow through’ process that is shaped along the II + EE + MLC + OC + RNE build towards = SCA, framework. Innovation Alignment to the Corporate Strategy does need working through. It needs linking to business goals and strategy, to the role innovation plays within this, the type of innovation portfolio you wish to design and work upon and the delivery and adoption needed so the organization ‘aligns’ itself. You need a thinking-through process to align context into activity. This takes time, it needs sustaining effort but it needs leadership to understand the critical connecting parts to do this. It needs a defining framework that I see as separate to what I’m offering here. On my present rate of outlining this it does seems sometime next year for that – not good news for those interested. Actually let me share a little secret between us, I’m working on a more radical, visually appealing and exciting way to approach this now but within a joint collaboration around this critical issue. So, who knows this might be discussed earlier than my past track record of once a year to move from one aspect to another. It needs to be and I’m sure my collaborating partner on this will be pushing me a lot harder going forward. Some time back I compiled a list of those critical areas that I felt need addressing for innovation to have a chance of success. Going through them again today and in light of different insights picked up on the way, I added more of a descriptor to each. I certainly think these reflect the struggles within innovation that need working upon constantly, so it has a better chance to succeed. This revised thinking I feel has upgraded my own focal points as areas I will be exploring even further in my work in the period ahead. What do you think? Do you think the list is missing something? My upgraded thinking on the 20 top innovation aspects to master and resolve. 1. There seems so much ongoing difficulty to identify the real opportunities for innovation as there is often no structured approach to this, or even worse a poor recognition of any well formulated strategy, so allowing so many opportunities to fall through the gaps. 2. Not generating and managing ideas that deliver real growth, mostly due to a lack of any effective decision-making process, organised governance and structure to manage this. 3. A on-going failure in not effectively seeking out external insights in clear ways and lacking a capturing structure to achieve this, so simply restricting the real awareness of the external environment to the necessary person internally within the organization. 4. The inability to draw down from a diverse set of networks, partners, systems and people and then connecting them in a ecosystem to acquire, transform or exploit this new knowledge for new innovation. 5. Not setting the appropriate focus on innovation activities for value creation and making those critical points explicit enough within and across the organization, so leaving it too open to personal interpretation and fuzzyness, resulting in often disappointing end results. 6. Not having a clear alignment to the Corporate Strategy for innovation, often missing the connections between formal and informal mechanisms needed for managing innovation. 8. Failing to recognize and build innovation capabilities across the organisation that deliver the appropriate mix of skills and experience by often not appreciating the significant differences between the types of innovation necessary and their unique characteristics to execute through these. 9. Building the competencies to further strengthen change is based far to much on existing organizational cultures that focus on effectiveness and efficiency, failing to recognize this is often in conflict with innovation, that is requiring a far more open ended, adaptive approach. 10. Having different expectations and behaviours across the organisation, divergent opinions and significant disconnects of self-interest and petty politics that override innovation intent. 11. Continually having changing priorities and conflicting responsibilities by not successfully managing the conflict between short and long term needs that are required to be managed in a more structured, thoughtful way. 12. A lack of concerted effort to encourage collaboration across and outside the organization I would suggest is limiting organization design in flows and effectiveness for innovation success. 13. Diverse systems that restrict the flow of knowledge sharing and don’t capture and share those aspects that would, if overcome, would trigger fresh insight and growing awareness of valuable alternatives. 14. Inadequate understanding of consumer and customer needs as the front line engagement process is not alert enough or trained to discover these, or often don’t have a system in place to report these back in the knowledge and incentive that these are seen as important by the customer. 15. Localised innovation that does not engage the whole organisation and continues on a silo basis, pushed by local managers as their pet projects, starving more critical ones and not being well picked up due to a lack of a comprehensive innovation portfolio management system. 16. Largely being reactive to competition and not being proactive, due to this constant struggle to fully understand the external environment and failing to anticipate those future trends and where they fit in their implications for the organization and its innovation focus. 17. Lacking a leadership perspective of the “ideal” culture and climate to inspire innovation and really appreciating what real differences do motivate people at the different levels for them to participate and actively engage in innovation activity or simply not. 18. Not having enough time, resource and resolve to grow innovation activity, as innovation and its appropriate management has not been fully designated as a clear function, with designated accountability, well resourced and integrated within and across the organization. 19. Failure to exploit the know-how and IP within the organisation and explore its potential with partners, so its potential can be fully exploited and commercialised instead of often just left ‘gathering dust’ as simply a protected patent not being exploited. 20. No clear and distinct measures and metrics to drive the innovation process effectively across the organisation and for the individual to relate to, that aligns the efforts with promoting and exploiting innovation as part of everyone’s responsibility. Having an honest conversation at board level is a good starting point. Reflecting on this twenty points alone and being open enough in addressing them can make a dramatic difference between success and ongoing disappointment. Leaders or those tasked with innovation need to have this honest conversation, if they come up short then they need to ‘reach out’ and seek fresh external advice on how to resolve these gaps so as they can quickly understand their gaps. I would argue executives should not be afraid to ask. Having a deeper understanding can often come from a dedicated focus often not possible within the confines of one organization. The external advice offered can help move them towards a more successful innovation management structure to succeed in those innovation efforts and go closer to match their desires and growth goals from innovation. Sometimes it is well worth reaching out for fresh perspectives and even, a dose of reality. I’m sure we have all come across the Rubik Cube, a 3-D mechanical puzzle, invented in 1974 by Erno Rubik as one of the world’s best-selling toys. The classic cube has six faces covered by nine stickers each offering a solid colour (white, red, blue, orange, green and yellow). The cube has a pivot mechanism enabling each face to turn independently, thus mixing up the colours. For the puzzle to be solved you must achieve that each face is to be made up of one consistent colour. We need to see Innovation as an entire structure where we constantly need to move the parts. We always want to seek alignment, perfect alignment. That dream of achieving all, within that specific aspect of innovation we are attempting, is fully lined up and then we are content. Impossible! What we fail to realize the total structure within innovation is always turning; it is always altering its ‘face’ to adapt to the changes we need to adapt too. We can never achieve perfect alignment, the makeup of innovation is constantly changing, so what we must do is keep moving the different ‘faces’ around to meet at best, a temporary alignment. That is the best we can really do. Unlike Rubik’s cube where you have 239,500,800 ways to arrange the edges, it does seem like innovation! In the Cube you have eight corners and twelve edges and eight ways to arrange the corner cubes. Seven can be orientated independently and the orientation of the eighth depends on the preceding seven giving 2,187 possibilities. You can even flip eleven edges independently with the flip of the twelfth depending on the preceding one, giving 2,048 possibilities here. They suggest there are forty-three quintillion positions and perhaps even more but you are getting the ‘permutation’ picture of the Cube and perhaps of innovation! Attempting to align anything needs movement, a sequence of moves. Well if you think about it to achieve a certain innovation ‘state’ you need to bring a number of aspects or faces to closer alignment but these do need a planned sequence of moves in most cases. Relying alone on serendipity just may not work. 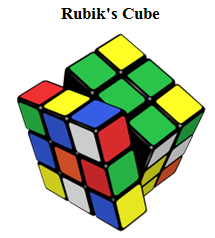 There are solutions to the Rubic cube that need less than 100 moves and in July 2010, a team of researchers including Rokicki, working with Google proved the so-called “God’s number” to be 20. I think you will agree there are many consultants offering the equivalent “God number” of ways to solve innovation, their “omniscience” moment. I sometimes kid myself I’ve crack innovation only to recognize minutes later I had forgotten something or not fully accounted for it in my concept -it just keeps me going even more. Yet Innovation is a consistent challenge, sometimes another millstone seemingly around our necks! Yes the Rubik Cube feels often like innovation, you change one part and it has its consequences on another. When you reflect on all the permutations required in innovation you recognise it is a constant, evolving, ever-changing puzzle. For me the enjoyment of the Rubik Cube is to keep thinking and moving around the different parts. I’ve never been able or patient enough to solve it but like innovation it still fascinates me. The difference is unlike the cube which can be solved, innovation as such, cannot. We can only arrive at a given point, and then it changes again. What keeps me motivated is moving the different parts so we do arrive at an improving situation but never a complete one. We need to keep moving the innovation parts constantly. The best we can do is work consistently to attempting to align as much within the innovation puzzle (processes, culture, people, functions, concepts, technology etc) and get it as close as we think we can and push through the idea, constantly pivoting as we go, to achieve a better solution than before. We can’t stop searching, we also can’t achieve perfect alignment for innovation but we can alway be constantly moving towards a certain harmony, that allows us to make sure we are making progress on where we were that time before. All we can do is keep turning those different faces of innovation and get closer to ‘alignment points’ but never, it seems, achieving the perfect alignment, that ultimate moment unlike the (simple) Rubik Cube. 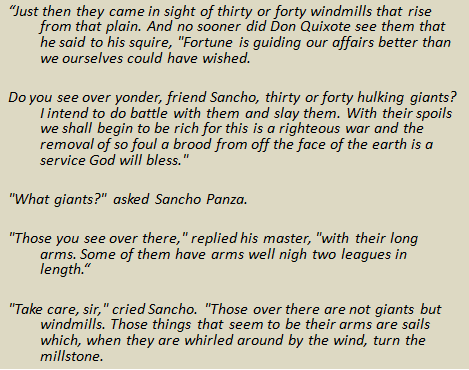 Perhaps the answer does live within the wind that drives the windmills. When you have some sun on your back after a long period of those winter months, you just always begin to feel life is so much better going forward. Life seems to reawaken within. I often wish we could capture the ‘sense’ of spring and what it promises to bring from this change of season. Those of us who witness the change of seasons are so lucky. Spring captures that growth moment. It is often talking to us of renewal. Innovation needs that capturing opportunity as well. We still can’t find a common language of understanding within organizations, or dealing across organizations. We just simply end up spending a ridiculously large part of our time “talking at each other, or across each other” We lose so much time, energy and opportunity. Innovation is challenging, it is complex, yet we chose to ignore so much of what is available to us to ‘spot’ new possibilities, resolve those unmet needs or improve on what is offered to help in our daily needs. With there being so much conflicting advice being offered in this innovation space we ‘freeze’; regretfully not for the right reason, to enjoy the moment, to learn from it, to take something positive away to improve our lives but more than often we become even more unsure and stop listening. We shut out many of the sounds because they conflict, they are jarring and not as they should be, in harmony. I’ve argued, as have others, we need to find a common language for innovation. Alexander Osterwalder in his opening to his concept of the Business Model Canvas always starts by posing the question on Business Models “We lack a common language” as everyone see’s the business model differently, if at all. The brilliance within his canvas approach is that it offers a unique way to bring everyone onto the same page. We need to do this across more of innovation’s activities- to bring everyone on the same page. I see the canvas approach taking hold in many different ways. I’ve read about the Enterprise Canvas, the Business Architecture Canvas, the Lean Canvas, and recently the Business Case Canvas. I watch with growing interest the approach taken by Paidi O’Reilly, along with some of his colleagues in Ireland, who are presently working on the development of their view of an Innovation modelling software tool. It offers up at its heart, an Innovation Model Canvas, for moving from generation to commercialization. I’d come up one level on what I’ve seen and read of Paidi’s work and argue we need an Innovation Structure Canvas as well. One that articulates the innovation environment we would wish to operate within. Something that ‘frame’s’ innovation from that firms perspective so we can keep going back to this overarching ‘innovation canvas’ to confirm and test where we are going to see if we are achieving the climate and environment we agreed . If we could learn to capture, articulate and explore what we want to achieve on this “Innovation Structure Canvas” we can really begin to talk to others in a shared language. Open innovation, collaborative innovation is fraught with misunderstanding. Whenever we engage with others we must work hard at overcoming differences of opinion, if we want to engage them in our venture. Structuring our conversations firstly around this canvas perhaps is a good way to test and validate what is in there, shown on this one page canvas so we can gain far more quickly from the other person’s reaction in smarter ways. They can identify or challenge what we want to achieve and we all can achieve and go to a deeper level of conversation by sharing this common starting point. Steve Blank argues we all need to get out of the office more and test our hypothesis. Innovation is uncertain, it is often made up of guesses and hunches, of sparks of ideas and the more we can ‘show’ its potential value, the more others can relate and improve on that concept. Steve has a customer development process based on two distinct parts- search and execution.Creating a right environment for innovation is made up of a constant ongoing search and execution also. Business the world over is in search of growth, more today than for a long time. We are ‘emerging’ from a severe downturn, a shock to the world’s economies and one thing recently struck me as a gap to fill, to build a bridge across a divide. Large organizations are desperately searching for ways to change, to adapt to the new circumstances and challenges happening. The problem for many is they simply don’t know how too, the more they try, the more it seems complex. They often lack the real courage to rip up the existing business model and all that supports it. They presently are searching for the how too so as to navigate in these choppy waters of change. Small organizations are seemingly more nimble, less burdened with heritage, legacy, superstructures that weigh you down and they can see so many breaking opportunities on where change is happening. They are closer to the ground from ‘seeing it’ to ‘reacting to it’ quickly but so often get held back for the lack of the very resources large organizations have, often in abundance, to mobilize and capitalize once they are set on a course. Now is a good time for both large and small to find their ‘complementaries’, to recognize that have value even more to collaborate together. The large organization might have to moderate it ‘predatory’ behaviour though, the small organization’s fear of ‘David and Goliath’ and worried their ‘single shot’ is not going to make the mark does need careful and consideration in managing. They both need to find new ways to combine, so the ones that have resources work with the ones that have the ‘sharper’ pulse of seeing opportunity, and this combination of ‘creative juices’ and ‘appropriate resource and energy’ are combined for mutual gain far more in collaborative, mutually sharing ways. Not in the old ways of simply ‘acquisition’ that so often tended to destroy the very entrepreneurial essence that gave the success to the venture. Great ideas are often captured on a napkin, on one page. We need to find ways where that initial capture of a great idea, of a real reason for instance on why ‘we’ should combine forces, needs some capturing mechanism. The concept of the one page canvas can be the place to paint our vision but in a structured way and the initial meeting place for innovation to come alive for all those that choose to go there. The pressing need is in finding a different ways to talk a common language. If we do want to move beyond our past ways to manage, top down, bottom up, we need to engage far more people, across a far more diverse marketplace of interested parties. We need to draw them in, to seek their participatation and understanding, within our innovation canvas design, so we are all on this same page. We might want to extend the concept of the canvas across business in even more novel designs than the Business model canvas so we can quickly sketch, to discuss and to listen to all those who chose to want to engage, who equally want to share and seek out fresh opportunity. Innovation might be made of many things intangible but it can be captured. We need to allow it to be seen, just like those first ‘green shoots’, so it can be nurtured, improved upon and fully shared in common understanding. Just like spring, we need to ‘trigger all our senses’ for the need to grow, to talk to each other in a common language and appreciate how we are going to ‘set about’ innovation by achieving this new growth that can only be really achieved in a different way of shared understanding. Looking across a sea of faces you feel that certain resigned feeling, that lack of empowerment, you press on, encouraged by the movement, not within the eyes but the clock. Is that the only thing ticking? You shudder. How many times have you felt that ‘wave’ of oppression when one colleague looks nervously at his boss just sitting across from him in the same workshop or conference, hoping to gain some new, fresh glimmer of hope? None comes, just a stony, empty blank face staring straight back. It is really sad but with all that is written about innovation, discussed, offered as leading, best or emergent practice, the majority still simply don’t get it and if they do, they often are forced to keep quiet about it. It can be depressing to witness. Often you get that feeling the different (and latest) innovation message simply rolls over, a little like the mist rolling in off the sea on a foggy wet day, slowly clawing itself up over a wet rock to suddenly stop and hang there, waiting for something to change. accelerate good ideas to market as new products and services. In mid-sized and large companies, CEOs and senior executives are vital to innovation success. What’s more, these leaders want innovation to happen. Jeffrey Phillips and I have been working on a collaborative ‘white paper’ on this real leadership gap when it comes to innovation. We are still moving this back and forth between us but it does seem from these exchanges from our own independent experiences we have one awful yawning gap to plug before we get that ground swell of innovation empowerment. More will emerge in the weeks and months ahead to get the message of hope out. If we cannot get this vital message out to the one person that matters for making innovation happen then we will continue to look out and see this sea of faces, who are really wanting to engage. Deep down they do know the problem but can’t seem to influence the way innovation is managed. Just simply knowing that yet they are not in the position to change it. It can’t be ‘released’ until they have been given permission which so often seemingly falls only at the highest levels within the organization, so they wait. They wait so they can safely extract from all the environment and tools that can be easily available to make it happen, if they have this feeling of confidence and given belief and lasting support. How can we bring “innovation into every persons life? Jeffrey and I are trying to construct some different ways to get the message out there and make a more meaningful connection to the leaders than can ‘allow’ empowerment. All I know is that ‘relief’ when you come back in from that walk on the cliffs, you shudder from that damp cold and are just grateful you can feel the sunshine just beginning to clear away that mist. We need to organize the winds of innovation change at this leadership level. We simply need to find ways to unlock and unleash that incredible latent energy waiting to come out of many organizations, locked in their yoke of innovation oppression. Empowerment should not be so elusive, it needs to be demanded, so innovation can really change our lives and allow “great things to happen” that we can all find hidden within ourselves. In the US, they are entering the political season again but I feel we should offer “the yes we can” one up for innovation this time as a movement of change, as it offers the pathway towards real engagement and growth, surely that is empowering for us all, leaders especially.